Action, adventure, romance, or comedy – whatever your taste, summer is the season for movies! There’s no better way to escape a hot afternoon than a watching a blockbuster on the big screen. While we all love a cozy movie night on the couch, summer is the perfect time to go out and experience something new! Indoors, outdoors, and even in the water… we’ve gathered five unique places to watch a movie in the Frisco area! So in between your busy summer day activities, swimming lessons and camps, take a little time to sit back, relax, and watch a movie! Your family’s regular Friday movie night just got a lot more fun! 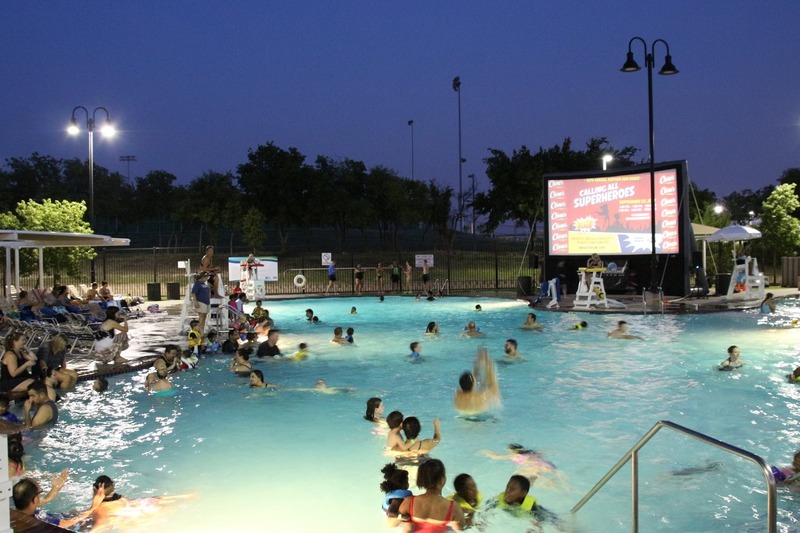 For three Friday evenings this summer, the Frisco Aquatic Center presents a “Dive-In Movie”. Families can enjoy playing in the pool and floating the lazy river while watching the crowd-pleasing films like Mary Poppins Returns and Ralph Breaks the Internet on the big screen. Travel back to the 1950’s this summer and watch a movie under the stars at the Coyote Drive-In! Located just up the road in Lewisville, Coyote Drive-In is a nostalgic treat for the whole family. The summer line-up is fun and family-friendly, with new releases like Solo and classic favorites like Indiana Jones. Shows start at 9:00pm (each night has a double feature) and the theater recommends arriving at least 90 minutes early for prime parking. But don’t worry, with picnic tables, a full restaurant service, a pizza bar, craft beers, and wine, the wait will be half the fun! You can watch from your car or bring blankets and lawn chairs. Bonus for pet lovers: The Drive-In is dog-friendly so furry family members are also welcome (on a leash or in the car). The brand new Flix Brewhouse, located on 423, is ready for you this summer! A visit to this specialty theater is a treat for the entire family. Flix takes the idea of “dinner and a movie” to the next level, with a full dine-in menu featuring fresh, made-in-house options like hand-tossed pizzas, burgers, and wings, plus traditional concessions. The theater also houses an on-site craft beer brewery with a huge selection of specialty beers brewed daily and on tap. And did I mention the luxury reclining chairs? Flix Brewhouse is the perfect place to watch, dine, and unwind this summer. Wednesday is “discount day”, with $5.25 admission all day. Also, the theater has special screenings for kids throughout the summer, featuring classics like “The Land Before Time”. Two enthusiastic thumbs up! A dive-in movie at Hawaiian Falls is a must for your family’s summer “bucket list”! Kids can enjoy all the spills and thrills of the water park (which stays open late on movie night) and then splash in the wave pool during the feature film. Be sure and check out all of the special events Hawaiian Falls offers families this summer, including half off admission days, Family Four Packs, Twilight Pass, and meet and greets with popular characters! Looking for the perfect date night, girls night, or family evening out? Try out the Downtown Dallas Movie Series. The free screenings take place outdoors in the scenic Art District and feature crowd-pleasing musicals like Chicago, Sister Act, and Hairspray. Make the most of your trip downtown and arrive early to enjoy all that the Arts District has to offer. The renowned Nasher Sculpture Center is a gorgeous space to explore (kids 12 and under are free) and the Dallas Museum of Art has free general admission for everyone (and interactive areas for kids). Grab a picnic dinner “to go” at any of the great area restaurants or check out the food truck scene at nearby Klyde Warren Park. Bring your own blankets and chairs for a memorable evening under the bright city lights!